The Oki ES9455 MFP (25 ppm), ES9465 MFP (35 ppm) and ES9475 MFP (50 ppm) are all toner-based multifonction printers which use LEDs rather than lasers. This allows them to be smaller and to consume less electricity. 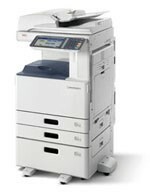 The Oki extension plateform, Open Platform sXP, which resides on these MFPs allows them to host components of several document capture apps which can hugely facilitate the integration of paper-bound information into company business systems, and also to host cost control and security apps. The ES9455 MFP and ES9465MFP can be equipped with an internal finisher with two output trays. All three models can be supplied with a saddle-stitch finish booklet maker. They are all equipped with a 9" touch screen interface. These machines are rebadged under an OEM agreement with Toshiba. They are the Oki equivalents of the Toshiba E-Studio 2550, E-Studio 3555 and E-Studio 5055 launched in July 2013. All the technical information on these machines is available on Your DMO!